Trafalgar Cottages are the budget traveller's ideal. 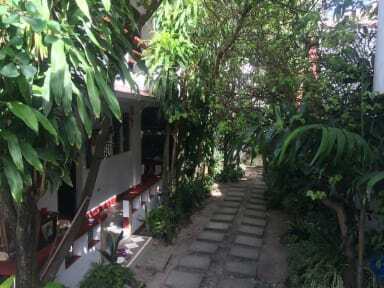 Conveniently located in the centre of the island near Station 3, we are a well-established, friendly, family-run hostel with a range of fan and air-con rooms to suit all needs. 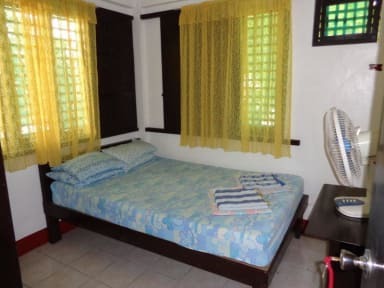 Our spotlessly clean and very affordable rooms are nestled in a lush tropical setting about four minutes walk from Boracay's famous White Beach. Standard room amenities include a spacious private balcony complete with hammock, table and stools for relaxing on rainy days and a private bathroom/toilet with cold shower facilities. We also have private fan rooms with a shared bathroom, toilet and a communal balcony with hammock. table and stools. We also have a common dining area for guests to get together, compare experiences and indulge in some cooking. Wi-fi is provided, but there is no TV or hot shower and stand-by generator.